the emerald coast of pensacola beach, florida, is a beautiful place to visit and charter. whether you are a new diver, an experienced diver, a spear fisherman, or a sports fisherman, dr dive, lcc has the experience you'll remember for years to come. give us a call, and i look forward to welcoming you onboard! captain jim meyers is dr dive. 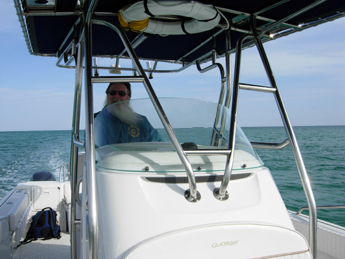 licensed as a clinical psychologist for over 25 years, captain jim has sailed vessels from 16 to 50+ feet, both motor and sail, for over 40 years. he has been certified as both a padi and naui dive instructor for more than 12 years. he has been instructing students in the northwest florida, gulf of mexico area, working primarily through dive pros since he became an instructor. his love for underwater photography began almost as soon as he hit the water, and all of the images displayed on this website (except those on this page) are captain jim's personal shots. do you need a dive master, a local dive shop, or a deep sea fishing boat for large groups? check out these trusted friends of dr dive. this is the spot to check periodically to see what's new with captain jim and what's happening in pensacola/pensacola beach. the blue angels weekend in july is always great! if you've never seen the blues fly over the beach, this is a "must see". this annual event has a practice show the day before the actual show.this is a great time for a private charter, but it fills up fast! how about a private, all day, charter with morning dives and returning in time to watch the blues from the water. if you'd like to see them this year, give us a call and we'll save your spot! for more information on what's happening in pensacola, click here! dr dive divers have had close encounters with eagle rays, dolphins and sharks. of course, there are too many others to name, but don't think you have to go to the southern bahamas to see some beautiful tropicals. the primary goal of dr dive is the comfort and pleasure of our customers. the charter vessel, a 2006 glacier bay canyon runner is a center console catamaran that reaches speeds of over 40 mph, making quick work of trips to further dive sites. the special hull design makes the ride fast, safe, and smooth, without the pounding often experienced in other boats. this vessel's open configuration provides maximum space availability and comfort for those onboard. dr dive is a 26-foot catamaran with wave slicing hulls and twin 150 hp yamaha engines. the ride is clean and dry in all sea conditions with a low environmental impact from the ultra low emission outboards. integrated electronics ensure accurate navigation, positive wreck location and safety with full radar and communication gear. amenities for customer comfort include ample storage, enclosed head, cushioned seating, full fishing and spearfishing capability, and insulated fish boxes for your catch. 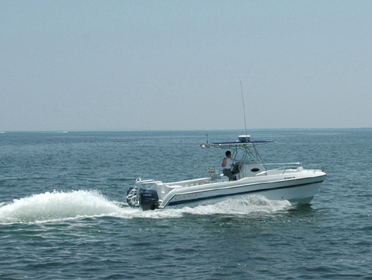 fresh water and salt water wash down, custom dive ladder, o2, first aid, step-through transom and ample deck space provide a safe and diver friendly platform. easy entry and exit make diving a pleasure, and plenty of insulated storage keeps your snacks and drinks cold for surface intervals. the glacier bay hull is the leading edge in catamaran design. the stable, semi-displacement hull tracks straight and resists roll, making for a smooth, comfortable ride. this hull design has crossed broad expanses of the atlantic, pacific and bering seas with safety, comfort and speed. 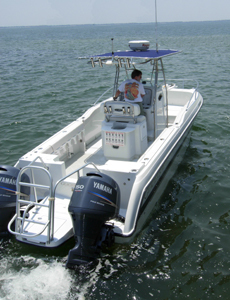 designed for serious, offshore service, this boat is capable of handling gulf of mexico conditions and delivering an unforgettable dive experience, safe passage and diver oriented comfort that will have you coming back for more.